Plural Endings: "S" and "ES"
Can your first grader figure out which plural ending form is correct for each word? Often, a noun becomes plural when it has an "s" at the end, but that's not always the case! 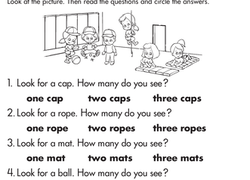 This worksheet gives your first grader practise. This mid-year assessment will give you an of idea how well your students know their coordinating conjunctions, irregular verbs and plural nouns, and regular verb tenses. Kids can practise changing singular nouns to plural nouns that end with s or es. Give kids a fun way to practise using parts of speech with this fill-in-the-blank story template! You and your students will be in a fit of giggles as you listen to each other read their completed zoo-inspired stories aloud! 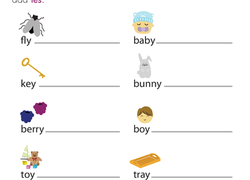 This grammar worksheet is a great review of the difference between singular and plural nouns. Use this helpful worksheet to practise identifying the difference between singular and plural nouns. Use this helpful sorting worksheet to practise identifying the difference between singular and plural nouns. Not all nouns are created equal. 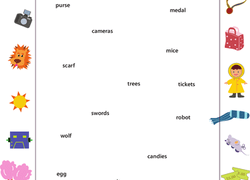 Help your child work on their tricky plural noun endings with this fun word sort! Step your grammar game up a notch! With this resource, your students will use context to decide whether to use the singular or plural form of a noun in a sentence. Help your first grader learn one of the trickier rules of plural nouns by practising writing the plural form of -y nouns such as candy and kitty. Review plural nouns with your child with this simple worksheet that asks him to circle the plurals that are spelled correctly. Use this exercise with your students to practise creating the correct plural form of singular nouns.